Felted Button - Colorful Crochet Patterns: Heads Up!! The Next Design Wars Challenge! Heads Up!! The Next Design Wars Challenge! If you have been involved with Design Wars in the past, you know how exciting it is! If you are new to Design Wars, take a minute and look around here to see what it is all about. Basically, it's an elite crochet competition where select designers work behind the scenes, often using the same yarn or theme to design something unique and amazing. And believe me, the designers never disappoint! And I've thrown my shoes hat into this round! Well, ok, these are just my favorite shoes. I was taught to crochet by my left-handed granny. Since I'm a righty, I'm still not certain how she pulled it off with a distracted and squirmy 9 year old, but I'll admit I found the process intriguing. From there I made only one thing that I can really recall...a hideously long, squeaky black scarf for my dad. See, my granny never taught me how to fasten off, so I just kept going until the entire skein was gone. That whole "not knowing when to stop" was a problem I faced in school, too, as my teachers confirmed. Indeed, I immediately got distracted--for over 30 years--with things like running hurdles, teaching high school sciences, and learning a lot about other crafty things. But then, being inspired by a number of crochet blogs, I found the hook my granny had given me and bought A LOT of yarn. Again, not knowing quite when to stop, I made the most ginormous blanket! 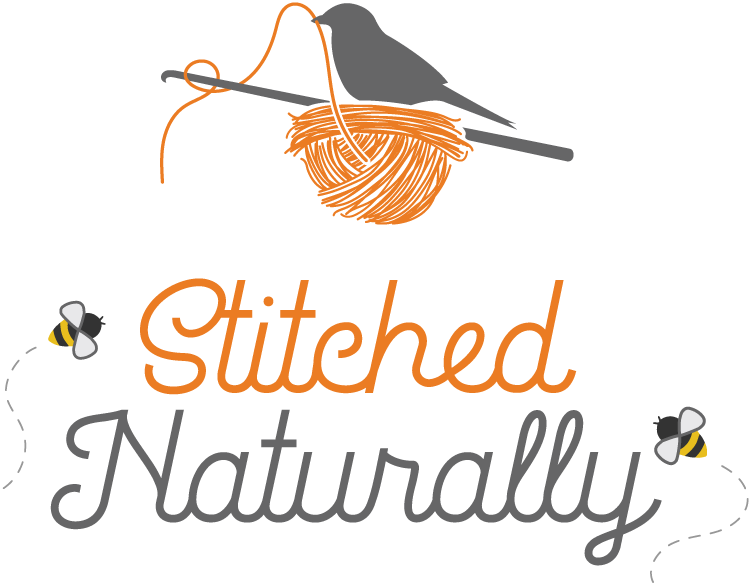 But I was "hooked" and have been crocheting ever since! I have what I call a very "noisy" brain. I crochet because it quiets the noise. And I remember as a child feeling the NEED to create something…anything. With crocheting, not only do I get a quiet mind, but also a wonderful, colorful, original handmade item to enjoy or share. Plus, do you realize how many colors of yarn there are? Anything colorful makes my wee heart sing! I love colorful yarn and my rainbow set of Clover Amour hooks! I love soft and colorful cotton, colorful feltable wool, and colorful buttons—hence Felted Button! Why designing and writing patterns? To have someone with their own hands translate and make a tangible creation from what started out as only an idea in my head, well, it’s magical!! Plus, I never have to make the same thing twice—it’s that distraction/focus issue again. For me, I tend to be more focused on the art of the design than the current style or trend or even season. That’s probably why I am drawn to blankets and rugs as they are essentially a huge canvas on which to "paint" or "draw" with colorful yarn! 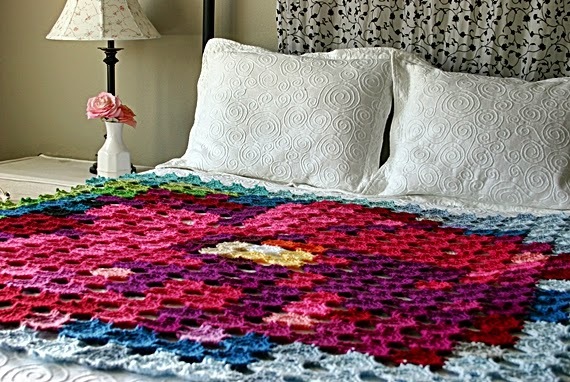 Like the Painted Pixels Blanket which is made with 7 colorways of a self-striping yarn. This one was taken on as a challenge to myself to see if I could make these 7 disparate balls of yarn actually look good together. Or the Rainbow Sprinkles Blanket which came to me as I imagined little sprinkles of color falling against a neutral background gaining more color as they fall into a colorful pile of happiness. Or the Pointillism Posie Blanket which dawned on me while reminiscing upon my sixth grade art class where we learned about pointillism. Each of the 29 colors of motifs—busted from my stash--makes a little spot of color that adds to the image of the huge flower! Texture and color are vital elements in my designs, but never at the expense of crocheting that is not pleasurable, as I believe the fun is in the action of hook and yarn in hand, not merely the finished product. So I strive to make my patterns friendly for various skill levels with any unusual stitches and techniques shown in detail. It has to be fun to make, right?! 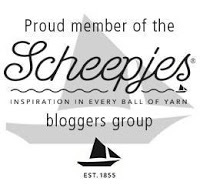 I am adoring this hooky adventure I am on and hope to continue designing, crocheting, and sharing some happy colorful creations with the world. I love meeting other like-minded crocheting fools geniuses like me and am looking forward to challenging myself with new designs and colorful creations! Now if I could only get focused on just one design at a …squirrel! Now knowing a bit about me, which will I choose? The colorful or the pile of white? So want to see my Design Wars creation? Hahaha (evil laugh)! You'll have to wait until the sneak peek on October 31. Then you can see all of the designs in all of their glory on November 7. And best part, you can vote for your favorites! Then, on November 14, the winners are announced. Their Facebook page is a great way to stay abreast of these happenings. This challenge is my third and I'm super excited--and always so silly nervous! Did I mention the caliber of the designers? The anticipation of seeing all the designs nearly kills me! But, as my mother says, "Waiting is good." Red Heart is sponsoring this round--with this fabulously soft and colorful bulky acrylic/wool blend! It is super fun to work with. And did I mention soft?! If you are interested in touching some for yourself and getting your "hooks" on some, you can find it at Joann and of course, at Red Heart directly. Thanks for stopping by. If you are new, I look forward to getting to know you better. And if you have been following me around for a while--THANK YOU! 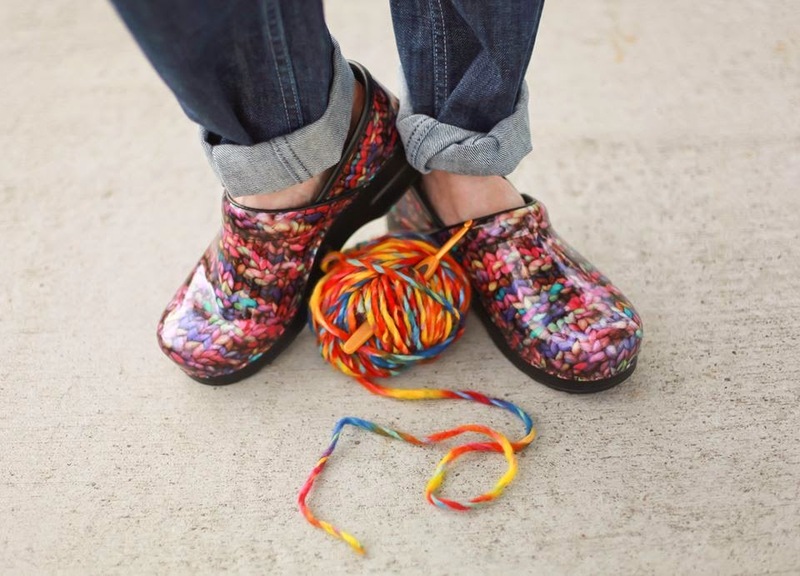 Sharing this love of color and yarn and crochet is something else!! Escolha o colorido e o branco!!! ho ho ! that's exciting !! enjoy it ! i'll enjoy following it ! see you ! Please do follow along. It's such a fun crochet adventure! Hi Susan! I really enjoyed reading about when, how and why you crochet and the design processes that go into it! PS: I like that photo of you with the chalk board!!! Ingrid, it is so nice to know that I am not the only "noisy" brain around! 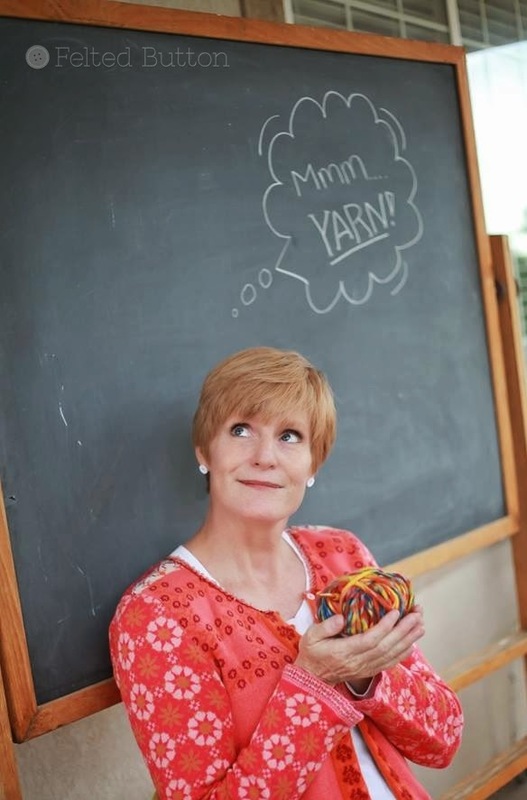 And I totally agree about how yarn inspires me to create! It's like magic! Thanks so much for your sweet comment! I'm oft to check out your blog! Wishing you all the very best, I will definitely be voting for you. Love the last pic!! How did you manage to get so many bottles and in the right colors too?!! Knowing you I am sure you are using the colored yarn and the whites too. :) Have a nice day. Thanks, Preeti! I remember you well--as you have been eyes and ears for me in the past! You are such a great person to have around. Fingers crossed, here!